The best decision you’ve ever made! Choose from one of the team members listed below who sent you to this page, right click on their name and open the link in a new tab. Make sure “Young Living WHOLESALE member” is marked off instead of “Retail Customer.” Wholesale member is the only way to get access to the kit and the 24% discount you get afterwards. It’s really important! Fill out all the information. It will ask you for your ss# but this is only for legal/tax purposes so that you have the ability to sign others up for kits too (YL is a referral based business). If you never sign anyone up, your ss # will never be used. Make sure you write down your pin, user name and password when you choose it because you’ll need that in the future to log in to your account. Select the “PREMIUM STARTER KIT” This is the one with the everyday oils kit and the diffuser. It will be $150. The other basic kits do not include the oils kit. Select “PREMIUM STARTER KIT w/ Aroma/Bamboo Diffuser.” If you would like this diffuser, the kit price is $160. One of the questions people new to Young Living often ask is: “Which diffuser do you recommend?” Well, let me start by stating that both diffusers are great! 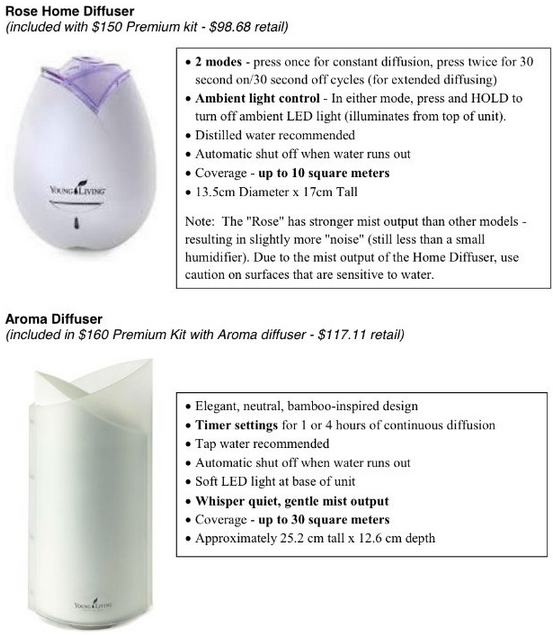 Both use ultrasonic technology to safely disperse essential oils into the air and activate the powerful plant compounds found in Young Living essential oils. 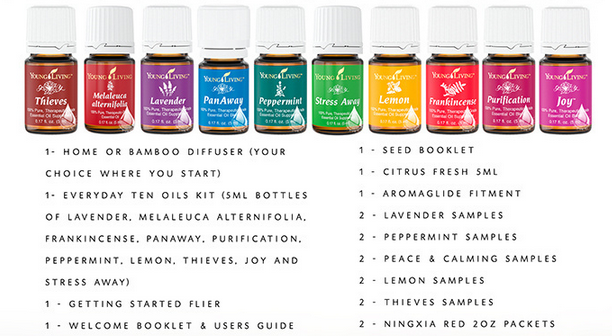 Plus, the diffuser comes FREE with the Everyday Oils Essential Oil Collection in your Premium starter kit. However, which one you prefer is up to you. Here are the basics so you can decide! Step 3- Pick your Essential Rewards Kit: What is it & do I need it? Essential Rewards is a way to save. You will receive reduced shipping and earn credits for free oils. This percentage increases with time: Months 1-6 you will earn 10%, Months 7-12 you will earn 15%,Months 13+ you will earn 20%. You must purchase $50 in PV each month, you can change your items each month and your shipping day as well. Cancel at anytime. This is great option if you will be ordering different oils each month or if you want to order oils for your friends at reduced rate., or are interested in the business side of YLEO. You can start and or stop at anytime! If its not right for you just click: “No, thank you, I plan on enrolling in Essential Rewards later”. You can always choose to become a Essential Rewards member later, which is what I recommend! Add any oils, capsules, or products that you would like in addition to your kit if there are any. I highly recommend the Aroma roller balls and Thieves cleaner! Check out. You’re done! Please let me know if you need my help. I am more than happy to share knowledge and resources and would love to walk you through getting started once your oils arrive!